Brenner tumors are the rare solid ovarian tumor, malignant variant being rarer. It commonly presents with vaginal bleeding, a palpable pelvic mass, and pelvic pain. Mostly, it is unilateral with local dissemination and spreading beyond the pelvis to distant organs is rare. It closely resembles transitional cell carcinoma of urinary bladder. Optimal surgery in advanced disease and surgical staging in the early stage is the corner stone of management. We report a case of malignant Brenner tumor of the ovary in 70-year-old female treated with staging laparotomy followed by adjuvant chemotherapy and having no evidence of disease after 2 years follow-up. Brenner tumors are the rare subtype of the surface epithelial-stromal tumors comprising 1.4%–2.5% of all ovarian neoplasm. It can be divided into three types – benign, borderline, and malignant. Majority cases are benign, whereas only 2%–5% is malignant. Less than 100 cases of malignant Brenner tumor (MBT) had been reported in the literature as of 2009. There is a predilection of Brenner tumors for the postmenopausal women and most often found incidentally in women between their 5th and 7th decades of life. Herein, we report a case of MBT of the ovary in a 70-year-old female. A 70-year-old postmenopausal female presented with the swelling of abdomen and loss of appetite for the past 4 months. Her medical history was uneventful. General examination revealed moderate pallor. On abdominal examination, an irregular mass of 30 weeks size, cystic with the restricted mobility was found [Figure 1]a. No abnormalities revealed on the speculum examination. On vaginal examination, there was a right adnexal mass with lower pole felt through right fornix, and pouch of douglas (POD) was free. She was investigated in the line of ovarian tumor. Tumor marker analysis showed CA125 = 30.18 IU and CEA = 0.9 IU. Her upper gastrointestinal endoscopy and chest X-ray revealed no abnormality. Ultra-sonogram showed a right adnexal cystic mass of 18 cm × 11 cm, no septa, no ascites with the normal uterus and left ovary. Right ovary could not be imaged. Doppler ultrasound of the pelvis showed low resistance flow over the solid component with RI <0.2. With a provisional diagnosis of benign ovarian mass, laparotomy, and intra-operative imprint cytology were planned. Staging laparotomy was done and abdomen opened by midline vertical supraumbilical incision. On examination, there was a right ovarian tumor of size approximately 20 cm × 20 cm with the intact capsule, and normal uterus and the left ovary. There was no free fluid in the peritoneal cavity, and POD, paracolic gutter, under surface of diaphragm, liver, spleen, and omentum appeared normal. Imprint cytology from right ovarian mass showed the presence of malignant cells but not the cell of origin. Total abdominal hysterectomy with bilateral salpingo-oophorectomy, bilateral pelvic, and paraaortic lymph node dissection up to the renal vein with total omentectomy and appendicectomy was done. 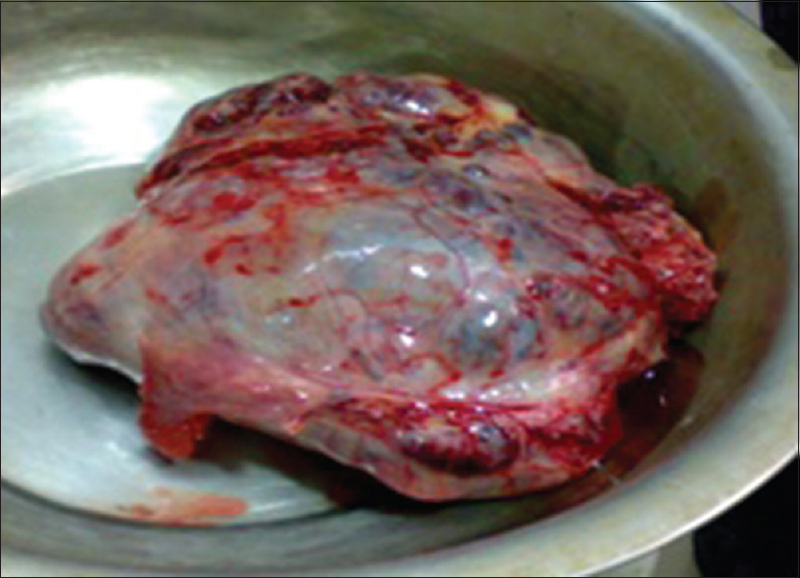 On intra-operative examination, a right ovarian tumor of size approximately 20 cm × 20 cm was found [Figure 1]b and specimens sent for the histopathological study. Macroscopic examination of the gross specimen showed variegated appearance, with both solid and cystic component with focal hemorrhagic areas [Figure 2] and microscopic examination revealed features of MBT [Figure 3]a and [Figure 3]b. The endometrium, myometrium, and all the lymph nodes were not involved on microscopic examination. The patient received 6 cycles of adjuvant chemotherapy with paclitaxel (175 mg/m 2) and carboplatin (area under the curve 6) combination regimen at a 3-weekly interval. The patient is on regular follow-up for the past 2 years with disease-free. In 1945, von Nurners first described MBT. The origin of the Brenner tumor remains unknown due to the rarity of the disease. However, recently, it is widely accepted as originating from the urothelial or transitional cell metaplasia of ovarian surface epithelium or the pelvic mesothelium. On microscopic examination, varying numbers of rounded nests of transitional or squamous cells such as epithelium and glandular structures of cylindrical cells within the abundant fibrous nonepithelial tissue are the characteristic feature of Brenner tumor. In 1973, Hull and Campbell proposed criteria for MBT such as: (a) frankly malignant histological features should be present, (b) intimate association of malignant element with a benign Brenner tumor, (c) mucinous cystadenomas should preferably absent or well separated from both the benign and the MBT, and (d) stromal invasion of epithelial elements should be demonstrated. MBT closely resembles transitional carcinoma of the urinary bladder with squamous and undifferentiated variants. The presence of heterogeneous growth and atypia with intervening stroma shows the malignant component of the tumor and consists of transitional cells, squamous or undifferentiated carcinoma, or an admixture of these types. There is the absence of established tumor markers for MBT due to rare incidence and variable histological criteria. On immunohistochemical examination, urothelial specific protein 3, thrombomodulin and cytokeratin 7 markers are found to be positive in MBT, whereas, cytokeratin 20 is negative. Data on clinical course and immunohistochemical studies showed that serum CA 125, CA72-4, squamous cell carcinoma are useful serum markers for the establishment of the extent of tumor burden before treatment and to monitor the response to therapy. The majority cases of MBT are unilateral and present with local dissemination. Bilateralism is seen only in 5%–7% of the cases. The diagnosis of Brenner tumor in majority cases is an incidental finding due to small tumor size and asymptomatic nature. In symptomatic cases, abnormal vaginal bleeding, perceptible lump, and pain are the common findings. It rarely may affect surrounding tissues and metastasize to distant structures. Less than 50% of cases develop metastasis outside the pelvis. It is difficult to diagnose MBT on imaging studies due to tumor's nonspecific appearance on ultrasonogram and computed tomography scan. Staging is the most important prognostic factor for the MBT. The early diagnosis and treatment is the best approach to increase survival outcome of the MBT. Complete surgical resection is the main-stay of treatment for MBT, but the exact regimen and benefit of adjuvant chemotherapy remain unknown. A recent study showed the promising efficacy of an intensive systemic chemotherapy in recurrent MBT cases. According to Gezginç et al., the mortality of MBT was approximately 50% and the mean survival time was 1 year. According to Austin and Norris, MBT confined to the ovary (stage I) showed excellent prognosis with 5-year survival rate of 88%. The behavior of MBT with the extra ovarian spread is similar to other. A study showed CA125 level decreased during the response to chemotherapy and increased during tumor recurrence, suggesting CA125 is a useful marker to monitor disease progression and treatment efficacy. The present case was diagnosed in a postmenopausal female, presented with huge swelling of the abdomen, unilateral location with disease confined to the ovary, and treated in the line of complete surgical resection followed by adjuvant chemotherapy. Verma A, Chander B, Verma S, Soni A. Malignant brenner tumor of ovary. J Obstet Gynaecol India 2014;64:148-9. Yue Z, Si T, Pan Z, Cao W, Yan Z, Jiang Z, et al. Malignant Brenner tumor of the ovary: Clinical, pathological and demographic analyses of 10 cases. Int J Clin Exp Pathol 2016;9:5642-6.
von Nurners C. A contribution to the case knowledge and histology of the Brenner tumor; do malignant forms of the Brenner tumour also occur? Acta Obstet Gynecol Scand 1945;2:114-27. Gezginç K, Karatayli R, Yazici F, Acar A, Çelik Ç, Çapar M, et al. Malignant Brenner tumor of the ovary: Analysis of 13 cases. Int J Clin Oncol 2012;17:324-9. Yamamoto R, Fujita M, Kuwabara M, Sogame M, Ebina Y, Sakuragi N, et al. Malignant Brenner tumors of the ovary and tumor markers: Case reports. Jpn J Clin Oncol 1999;29:308-13. Hull MG, Campbell GR. The malignant Brenner tumor. Obstet Gynecol 1973;42:527-34. Han JH, Kim DY, Lee SW, Park JY, Kim JH, Kim YM, et al. Intensive systemic chemotherapy is effective against recurrent malignant Brenner tumor of the ovary: An analysis of 10 cases within a single center. Taiwan J Obstet Gynecol 2015;54:178-82. Eichhorn JH, Young RH. Transitional cell carcinoma of the ovary: A morphologic study of 100 cases with emphasis on differential diagnosis. Am J Surg Pathol 2004;28:453-63. Borah T, Mahanta RK, Bora BD, Saikia S. Brenner tumor of ovary: An incidental finding. J Midlife Health 2011;2:40-1. Austin RM, Norris HJ. Malignant Brenner tumor and transitional cell carcinoma of the ovary: A comparison. Int J Gynecol Pathol 1987;6:29-39.